It is the 6th October 1962 and one of the best British comics of the 60's is launched which was starting the new mould of all action picture strip stories with comedy strips. Many more comics were to follow in this winning format. Valiant had some great comic characters. 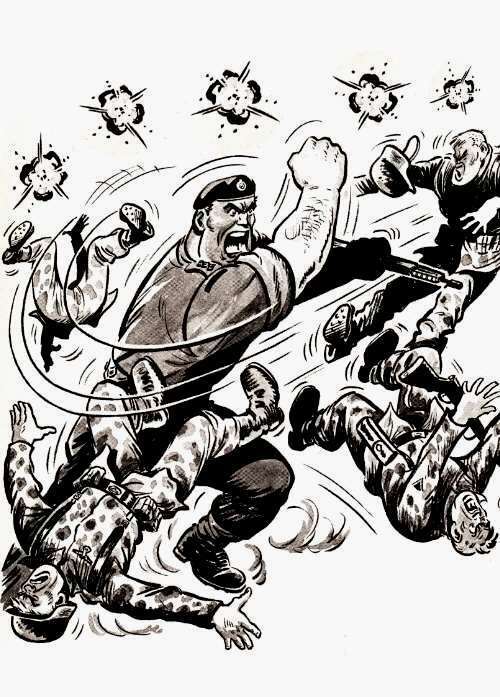 Captain Hurcules Hurricane of the Royal Marines fought both the Germans and the Japs during the Second World War assisted by his batman, Maggot Malone. Always in tight situations most of the time instigated by his batman. Great stories written with great humour. If our hero was upset would set him off into a Ragin Fury. Enemy beware! While working for Professor Barringer, Louise Crandell undergoes an experiment in which he has to wear an artificial right hand made of steel. The experiment goes horribly wrong and ultra-high voltage is passed through the hand which renders Crandell invisible except for the metal hand. He realises every time electricity flows through his steel claw he turns invisible. At the beginning he uses his powers for criminal activities, but reforms and works for the secret service. His name: The Steel Claw. One of the greatest Valiant stories that ran for many years was Kelly's Eye. Tim Kelly has arrived in South America to claim a vast fortune left to him by his Uncle. His Uncle owns the wealthy Los Solos mines. But the four men who had been running the mine since his Uncle's death had more than friendly plans for Tim. As Tim Kelly arrives he is arrested and marched on a four day trek to the mines to be sold as a slave. He escapes with an old native Indian who is dying and the old man tells him a tale of everlasting life if they find The Temple Of Zoltec: and the legend of The Eye Of Zoltec. When the native dies, Kelly carries on, escaping crocodiles and giant bats until he eventually gets his hands on the eye just as an erupting volcano destroys the temple. The powers of The Eye of Zoltec saves his life. Tim soon learns the powers of the eye and seeks revenge on the men who tried to sell him into slavery. As a youngster, The Steel Claw and Kelly's Eye was two of my favourite comic characters. The stories were so good and the concept of everlasting life for Kelly and the possibility of invisibility for Crandell, intrigued me. But Valiant had so much more. Kelly's Eye was first introduced in late 1963 and some great new characters were to follow. Legge's Eleven: Ted Legge has taken over as Player-Manager of struggling Rockley Rangers which has slowly fallen into rack and ruin. He builds up a team of soccer misfits, individuals in their own right, and we follow their hilarious exploits as they climb up the league! The Nutts: The Hilarious adventures of the Nutt family: Ches, Norah, Gran and kids, as they try to improve their lifestyle and homely abode, Nuthatch . This poor house ends up damaged most weeks. Poor Ches, would get ear-ache every week from, Norah! Billy Bunter The Heavyweight Chump of Greyfriars: Boarding School life was never such fun as Bunter tries to out-wit his school chums and Old Quelchy, so he can get his hands on as much grub as he can. 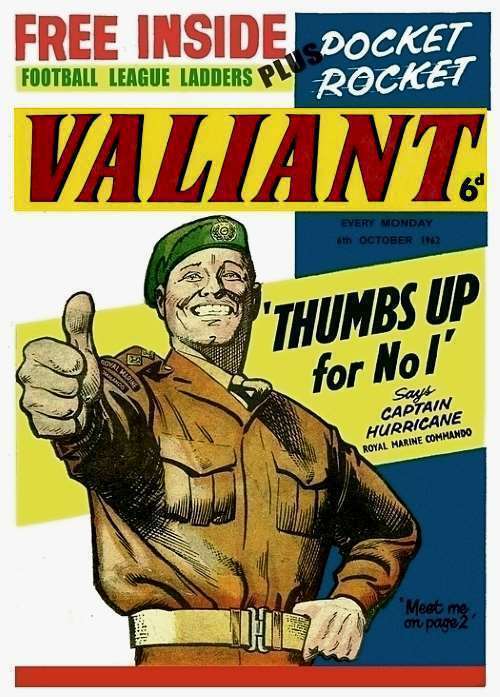 Valiant ran until 1976, and over the years incorporated some great comics - Knockout - Smash - TV21 - Lion and lastly Vulcan. So new characters for Valiant appeared like Adam Eterno - Janus Stark - Kid Pharaoh, to name just a few. Eventually swallowed up by Battle Picture Weekly. If you get a chance buy some early Valiant annuals or comics. They will keep you enthralled for hours.